State Senate Democrats intend to hold hearings on the state of the Long Island Rail Road, according to a letter sent to LIRR President Phillip Eng and the MTA, in response to a litany of transit woes faced by commuters. 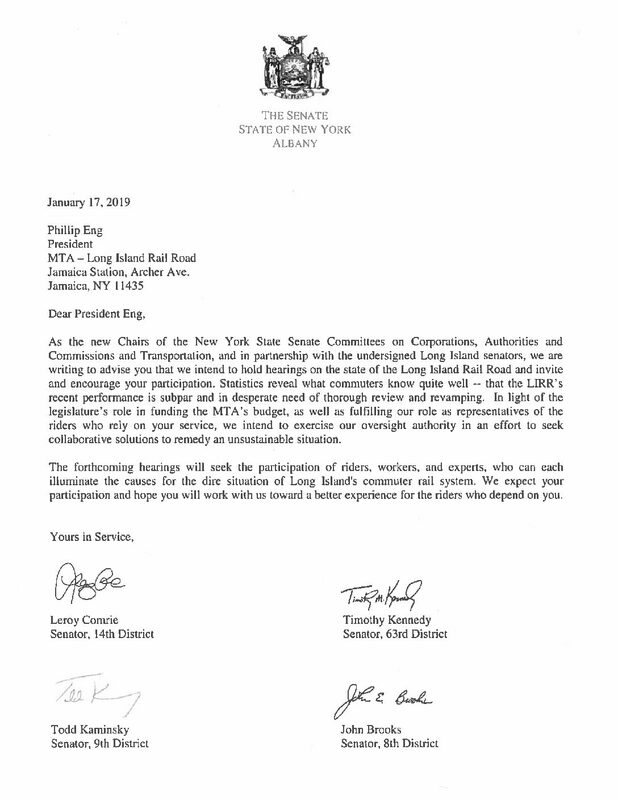 The letter, signed by the state Senate chairs of the Corporations, Authorities and Commissions and Transportation committees and six Long Island Democrats, put Eng and the MTA on notice about pending hearings and their oversight authority over the agency. The letter was signed by all six of Long Island’s Democratic representatives, including state Sen. Anna Kaplan, who represents North Hempstead, Elmont, and part of Hicksville for District 7. Exact dates for the hearings were not immediately clear Thursday afternoon. It also comes as the MTA, which oversees the agency, plans to implement fare hikes of about 4 percent in March to make up for a revenue shortfall. MTA and LIRR officials have attributed some past delays to weather conditions and an abundance of wet leaves, which can create travel hazards and wheel-damaging slippery rail conditions. At a previous LIRR committee meeting, Eng said they have not seen “the same spike or lengthy duration of impacts” as was seen in 2017 and vowed to “triple [its] efforts” to contain delays and improve safety.